The Rev. 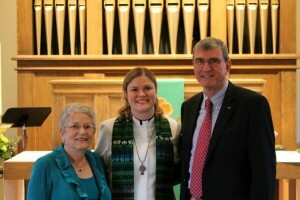 Dr. Christa M. Compton is a lifelong Lutheran who grew up in Lexington, South Carolina. Most of her family is still in S.C., including her parents (Charlie and Nancy), sisters, brother-in-law, and several aunts, uncles, and cousins. Her sister Claire is a high school math teacher, and sister Carrie is a nurse who is married to Judson, a Lutheran pastor. (Both sisters are happy to share stories about how Christa tormented them during childhood.) Christa is also the proud aunt of Addison (6) and Camryn (2), so she plays a pretty fierce game of Candy Land and reads Dr. Seuss with great enthusiasm. She is also a godmother to four terrific kids who live in California, Connecticut, and Virginia. After graduating from the University of Virginia in 1993 with a B.A. in English and a Masters in Teaching, Christa spent the first decade of her professional life as a high school English teacher in Columbia, S.C. Christa moved to California in 2002 to pursue a PhD in the Stanford School of Education, which she completed in 2007. From 2002 to 2009 she worked with the Stanford Teacher Education Program and enjoyed serving as a supervisor and course instructor for people entering the teaching profession. In her rare moments of free time, you might find Christa doing a craft project, attempting to exercise without hurting herself, heading to a movie theater, reading a book, Skyping with her family, following ACC sports, or catching up on episodes of “Mad Men” and “Downton Abbey.” She is also a music lover and enjoys singing alto with other folks who like to make a joyful noise. In recent years Christa has been trying to become a better cook, but the results are…well, let’s just say inconsistent.